By wicked hands, and feet quick to murder. Adrian dwells together with Natalia. Namely the four - hands and feet. 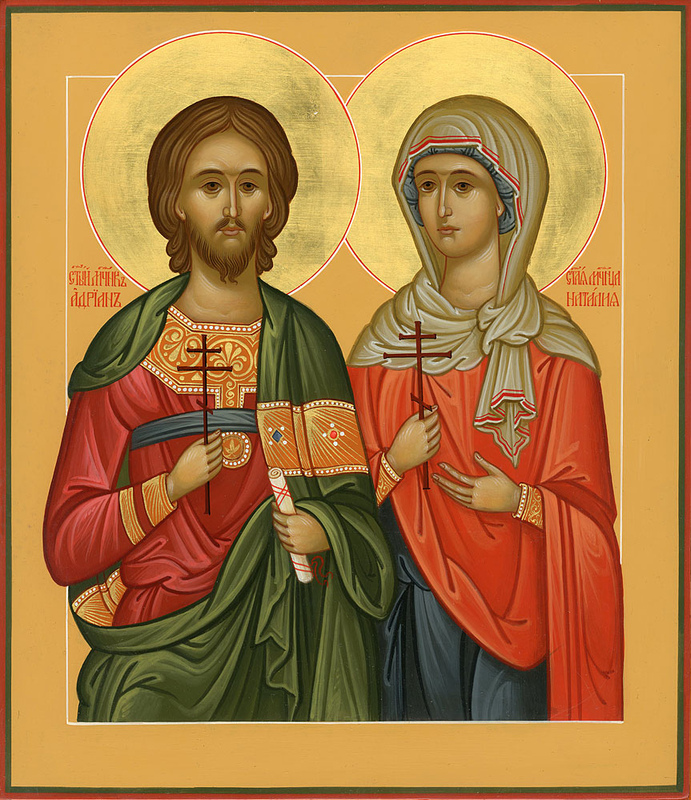 Saints Adrian and his wife Natalia hailed from Nicomedia. During the second reign of Maximian (306-308), there were twenty-three Christians that he found in a cave and inflicted upon them diverse tortures. Adrian, who was twenty-eight years old and head of the praetorium, learned of this and inquired of them why they endured such torments. They answered him, saying, "We endure them so that we might gain those good things prepared by God in the heavens for those who suffer for His love; indeed, such things which no ear can possibly hear nor word can set before the mind." This response moved blessed Adrian to compunction, and he was filled with divine grace, igniting a flame within him to also undergo torment for the love of Christ. Thus Adrian turned to the recorders who were preparing the lists of those Christians to be slain, and uttered, "Write my name together with the names of the others, for I too count it pleasure to die with them for the love of Christ." Whereupon, they entered his name in the lists, and had him bound with chains and locked in prison. Now his wife, Natalia, who was raised a Christian by her parents yet kept her faith to herself to avoid being violated by the pagans, was informed of her husbands imprisonment, yet she thought it was for some other reason, causing her to weep and lament. After she learned that Adrian was imprisoned for the sake of Christ, she arrayed herself in splendid clothes and went to visit him in prison. When she entered the prison, she kissed the bonds and chains which bound her husband, and praised him for his eagerness to demonstrate his witness for Christ. She also counseled him to remain firm and unshaken in the tortures. 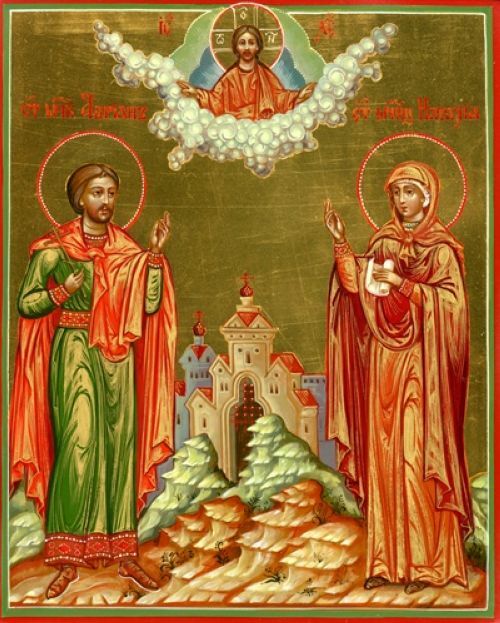 After her husband exhorted her to return home lest she also be imprisoned, Natalia left beseeching the other twenty-three Christians imprisoned with Adrian to pray for her husband. Having left the prison, Natalia returned home. Adrian, however, bribed the guards to release him for an appointed time to notify his wife that he would soon be martyred. When Adrian arrived at his home, Natalia assumed Adrian feared the torments and denied Christ, and reproved him for being a coward and lamented for the missed opportunity of being the wife of a martyr. But when she was informed of the true reason for Adrian's return, she was exceedingly glad and embraced him. They therefore returned to the prison together, where Natalia tended to the wounds of the Christians prisoners. When the emperor learned this, he forbade Natalia and the other women from coming to the prison to attend to the Christians. Undaunted, Natalia cropped her hair and, donning male clothes, she bribed her way into the jail. When Adrian stood before the emperor, he boldly confessed Christ, for which he was thrashed with staves, then thrown on the ground and beaten upon his thorax and abdomen till his entrails were exposed. 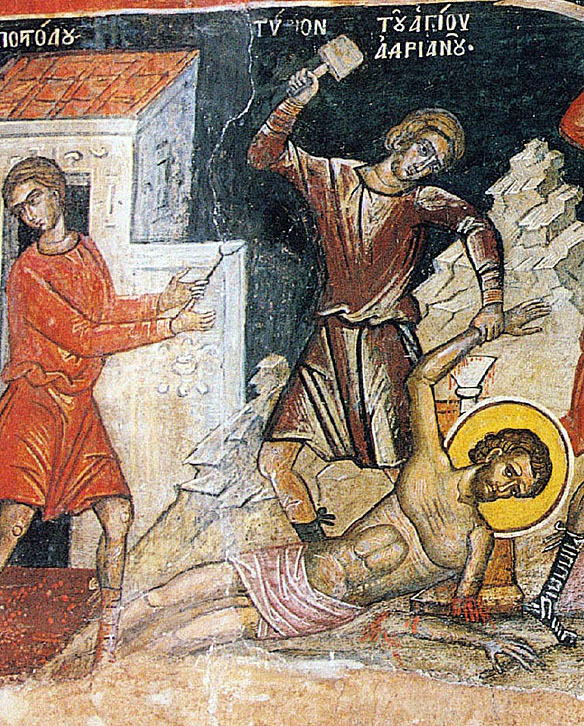 Afterwards, they cut off his hands and feet together with the other Christians. Indeed, Natalia was not only present at the severing, but assisted in the dismemberment by placing each member upon the anvil for cutting. She would even beseech the executioner to bring down the cleaver and hammer with a mightier blow, to render greater and harsher pain for the Saint; for she believed his reward would be greater. At the same time she emboldened Adrian and endowed him with strength to endure the pains courageously, so as not to betray Christ during his martyrdom. During the course of these torments, Adrian and Christ's twenty-three other athletes finished the course of martyrdom. The idolaters were about to cast their sacred bodies into the fire, when the blessed Natalia retrieved one of Adrian's hands. She hid it under her shirt, and attended to see the outcome of the sacred relics. And when she noticed the blood dripping from them, she anointed herself with it as if it was myrrh and spices. As the holy relics were cast into the flames, a sudden storm of rain fell and quenched the fire. 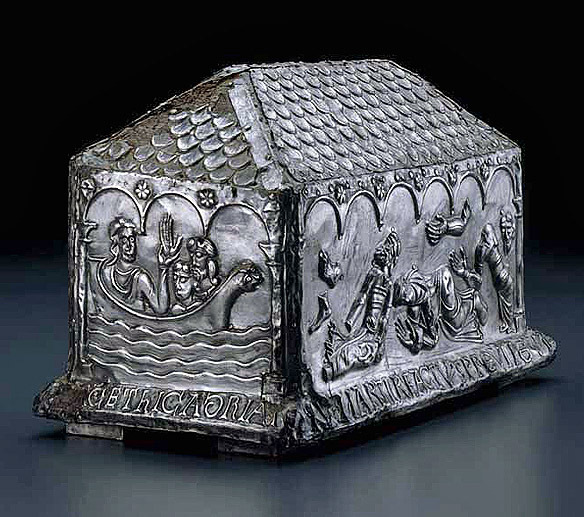 Whereupon, a certain Christian named Eusebius gathered up the sacred relics and brought them on board a boat. He brought them to Argyropolis, near Constantinople, where he interred them, and later on a church was built there in their honor. The names of the twenty-three athletes of Christ are as follows: Anatolios, Anthimos, Antiochus, Gentelios, Eleutherios, Hermogenes, Evethios, Euretos, Eutychios, Theagones, Theodore, Thyrsos, John, Karteras, Claudius, Kyriakos, Marinos, Mardonius, Menodius, Platon, Synetos, Troadios and Pharetrios. Shortly thereafter, Natalia was pursued by a certain imperial officer at Nicomedia who desired to take this young and wealthy widow as his wife. This caused Natalia to flee by ship to the location of her husbands sacred relics with his companions. Soon after she surrendered her soul into the hands of God, and was buried with the Holy Martyrs. Although Natalia did not shed her blood and suffer physical martyrdom, she is still numbered with the Martyrs for having co-suffered with them by ministering to them and encouraging them. As our Savior promised: "He that receives a righteous man in the name of a righteous man shall receive a righteous man's reward" (Matt. 10:42). "Adam's spouse exiled him from Paradise, by the counsel of the serpent; but Natalia, the all-wise, led Adrian to Paradise with sacred talks, exhorting and teaching him to patiently toil, being a mediatress of heavenly rewards and eternal glory." "O the ways of a God-loving woman! For she did not bring her husband corruption as Eve did Adam, but ushered in unbroken life for her spouse. 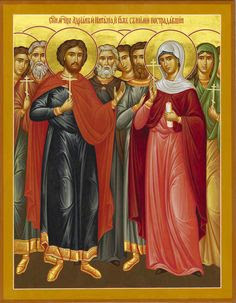 Praising her with her husband, we cry out to Christ, Grant us help, by the intercessions of Your Saints." Thou didst deem that Faith which hath salvation to be riches never lost or plundered. Thou forsookest thy fathers' impiety, and thou didst follow thy Master, becoming rich in His divine gifts, O glorious Adrian. With the godly-minded Natalia, who emboldened thee, entreat Christ God, O Martyr, that our souls be saved. Having wisely laid to heart all the divine words of thy godly-minded wife, Adrian, Martyr of Christ God, in torments thou strovest ardently; and with thy yoke-mate thou now hast received thy crown.